We love helping our clients to meet their fitness goals and enjoy their sessions as they work towards them. If you’ve worked with us, please feel free to leave us a review using the form below. If you haven’t worked with us yet, jump down to our customer reviews. What was your experience with Charlie Hart Fitness? Having always been intimidated in gyms and fearful of looking like the odd one out I was apprehensive when I started working with Charlie. 12 weeks on and I love every session. Charlie always pushes my comfort zone whilst making me feel good at what I can do. The results are starting to show and even though I have a way to go I am confident of making it with Charlie’s help. I attend Charlie’s boot camp on Saturday. Serious fun and hard work. Charlie is a hard task master but understanding to each individuals abilities and fitness levels. A few aches in my legs and core but I am eager to attend again! Honestly when I first met Charlie Hart I hadn’t been in a gym for about 6 years. Charlie respected this and set realistic goals and constantly motivated me to push that little bit harder. 6 months down the line I wouldn’t miss a session with Charlie for love nor money. His personal training never fails to put a smile on my face because he is willing to extra mile every time! Charlie knows his stuff and is always prepared to take the time to develop the right programme for each client. I hadn’t been inside a gym in many years so it was tough getting started but I feel much better after training with Charlie over recent months. For the last six months Charlie has been my personal trainer, he is always professional, knowledgeable, supportive and friendly and I have seen my strength and fitness levels improve. I can wholeheartedly recommend his services. Charlie is a hard task master but I love my one to one sessions with him each week. Each week is tailored to my needs, he works me hard and most weeks I feel the effects after but I’ve got so much stronger and I always look forward to my next session. When you submit your details using this form, Charlie Hart Fitness will process your information in order to contact you about your enquiry. For full information please read our Privacy Notice. 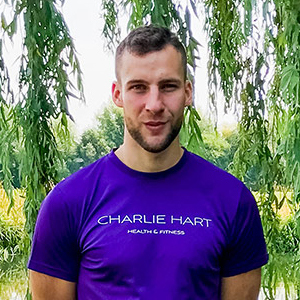 Charlie Hart is an experienced personal trainer, having worked with more than 100 clients clients in and around Cambridgeshire. His interests in fitness, health and how they intersect help his clients to transform their bodies, sleep better and feel better in themselves. Talk to Charlie today if you'd like help improving your well being.